As Mexican fans came in from every end of the Georgia Dome, the second match of this doubleheader began tense. As if the first game didn’t end with enough drama with the upset of the tournament (Jamaica beating the USA), the entire first half was chippy. There’s physical play and then there’s cheap shots. It’s hard to pinpoint what exactly caused the uneasiness between the players but yellow cards were flying everywhere as well as players, legs, and tempers. There were few chances for either side but the half was overshadowed by controversy. Things continued to get chippy between players and Panama’s Luis Tejada was the next victim, getting thrown out of the match for a “supposed” elbow. Once red carded a furious Tejada spent the next 4 minutes arguing with the referee and both teams went after each other. Play stopped for around 11 minutes as chaos ensued and Tejada was unable to leave the pitch for being pelted with garbage. Sadly, this has become a common theme during the tournament. From corner kicks to penalty kicks and celebrations to ejections, fans have shown their anger and disdain by hurling trash onto the field towards players and CONCACAF has yet to address the issue. Finally, in a move of true class, Mexican Goalkeeper Guillermo Ochoa personally escorted Tejada off the pitch so he would be safe from debris. The 2nd Half began with El Tri focusing on possession. But after a few minutes things went back to getting chippy once again between the players. Jonathan Dos Santos had a great chance from a free kick but it went just wide. Panama scored their first goal from a corner kick and Panamanian fans erupted. 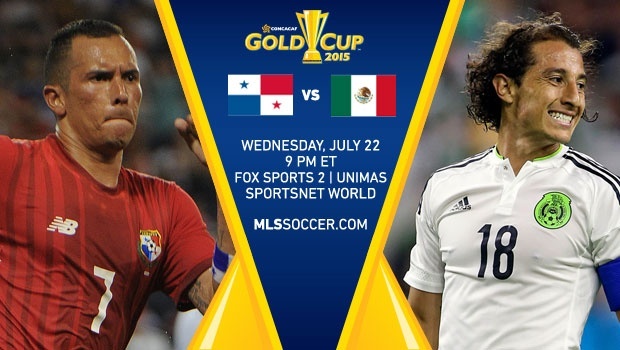 Román Torres nailed a beautiful header into goal to give Panama the lead. But again, the goal celebration was overshadowed by classless fans hurling debris on the players celebrating and also the players warming up on the backline (by the goal). With plenty of security on all sides nobody did anything. CONCACAF will have to address these atrocities or bad fans will not only make the confederation look bad, but our country as well (the main countries that have this problem are in Europe). Panama was playing so collectively you wouldn’t have known they were down a man. A short handed Panamanian side was giving Mexico everything they could handle. It was the same old story for El Tri: Loads of talent, zero goals. After beginning their Gold Cup campaign with a 6-0 win over Cuba, the Mexicans hit a snag in their play. Perhaps playing in front of the 70,511 fans in attendance was too much for them. Either way, there was no denying the tension, as tight as it was already, was still building and hadn’t topped off yet. After the 85’ Panama began milking the clock every available chance they had. Even with 5 minutes left to play, the Panamanians were playing with all the confidence in the world. It was clear that they didn’t fear El Tri. You could hardly tell they were short handed due to Mexico’s lack of creativity. Then in the 88’, another gift was given to Mexico on a handball which resulted in a penalty kick, which also led to chaos. The game was stopped for over 20 minutes due once again, to fans throwing trash on players, staff, and everyone else from Panama. When Coach Herrera tried to calm the fans down, they threw trash at him too. Things got out of hand and both benches cleared. It was unlike anything I’ve ever seen in a soccer match. It got to the point where some of us wondered if either team was going to stay to finish the game. Panama contemplated walking off multiple times but were pushed passed the brink and resorted to throwing trash back at heckling fans. Andrés Guardado would be the one to take the kick for Mexico and tie the game 1-1. After the stoppage the game was well past 90’ and regulation ended quickly. I’m starting to wonder what exactly it’s going to take to get FIFA/CONCACAF involved in this for player safety. As if things couldn’t get any crazier in this game, 15 minutes into extra time and Mexico are given yet, another gift in a PK. Javier Orozco was taken down in the box, the call was questionable, but Guardado took the kick and the Dome erupted. With Mexico now up 2-1, fans of both sides were heavily into the game. But how did they celebrate? Trash was thrown at each other as opposed to on the field. It was clear this game needed to end quickly for everyone’s sake. On a level of 1-10 the physicality of this game was on an 8. The players continued to test the referee’s restraint, with kicks and elbows and shoving. It was very apparent both sides were tired, especially Panama. Panama had one last chance to try and level the game but the referee called the game early, causing panic on the Panamanian side. They rushed the field to approach the ref who backed off in fear and was then led off the field with a ten-man security team. A very dejected Panama coach with blood shot eyes told us post-match that “At the 88′ I deeply considered retiring from soccer. Not because of my players but I considered it. At the 88′ you can’t be serious.” He also stated it was because of his players he continued, and when they wanted to quit and walk off the field he convinced them to play. Both coaches noted they had no problems with the other and that it wasn’t a Mexican problem or a Panamanian problem. Now after the game the drama got deeper. 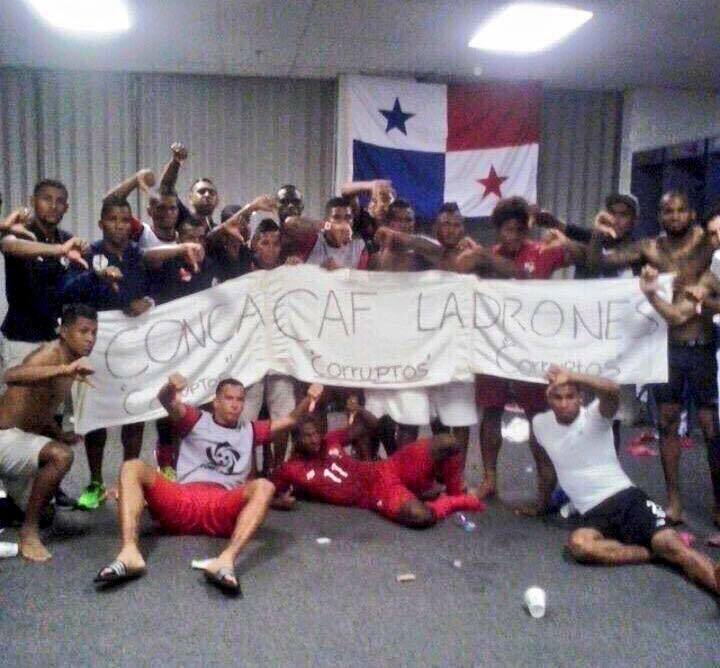 Panama players shared their opinions of what took place tonight (on social media) by holding up a huge banner that read “CONCACAF LADRÓNES” and on the bottom it reads “Corruptos”. Corruptos means ‘corrupt’ and CONCACAF LADRÓNES means ‘CONCACAF Thieves’. So the drama continues with lingering effects from this unforgettable match. A disrespected Panama side will face the USA in the 3rd Place match Saturday while Mexico will take on Jamaica.